Sign up for free 30-day trial. No credit card required. You can create courses yourself using easy-to-use authoring tools and/or we can recommend experts to create courses for you. Already have an online course? If your course supports the SCORM standard, then move to step 2 and start making money. 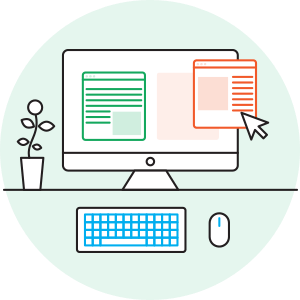 Get our eLearning Authoring Tool for free when you sign up. 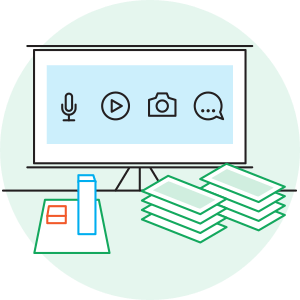 Turn a PowerPoint presentation into a course with Studio. Balance ease-of-use with power with StoryLine. Buffalo Video Production will quickly create professional level video for your course. Find out how. It's quick and easy to sign up. No credit card needed to sign up. Free 30-day trial. No long term contracts. After you sign up you can immediately upload your course(s) to our cloud servers. Add one or more courses to a package. Then sell or assign packages to your customers right away. Assign a package to 50 people in June, pay a onetime fee of $50. Assign a package to another 100 people in July, pay a onetime fee of $100. If you use our built-in eCommerce system to sell your package, you pay a 5% fee. If you have your own eCommerce site, you can sell packages from your site at no additional cost. Sell courses to your customers from our eCommerce system, your eCommerce site or use offline payments. eLearning Courses lets you combine one or more courses into a package. You then sell or assign the package to your customers. Use our eCommerce system to sell packages from our site, your site or your blog. When customers use our eCommerce system, the packages will automatically be assigned to your customer after the purchase is complete. You can use your existing eCommerce site to sell packages. When a sale is completed on your eCommerce site, just use the eLearning Courses portal to assign the package(s) to the customer. Your customers may prefer to pay offline. No problem. After the customer pays, use the eLearning Courses portal to assign the packages(s) to the customer. SCORM is the most popular eLearning standard. SCORM defines how a course communicates with a Learning Management System (LMS). eLearning Courses is a LMS. A SCORM course can tell the LMS all of the important details about what a person has done in a course such as the completion status, the bookmark, the score, time, the responses to questions and completion of objectives. If your course contains a file named imsmanifest.xml then it is probably a SCORM course. Contact us if you are not sure if you course supports SCORM. We offer the lowest price in the industry. There are no hidden costs. $1 to sell a package to a customer. 0% if you sell through an online storefront you own. 5% if you sell with our e-commerce link. A package is a collection of one or more courses. We are internet experts. Our cloud servers have a 99.9% uptime. We scale to meet your needs. We keep your data safe and secure. 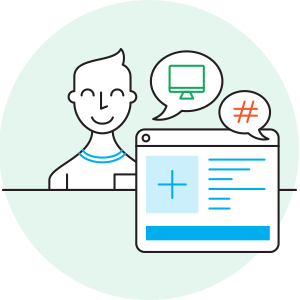 The eLearning Courses cloud servers are hosted on Microsoft's Azure platform. Azure is the leader in cloud-based business applications. We constantly monitor the uptime, security and availability of our cloud servers. We handle all of the technical details so you can focus on selling courses and making money. You always own your courses. Our solution helps you create, sell and deliver your courses with flexible selling options. We want to do everything we can to make you successful. We want you to grow your business because our success is totally tied to your success. Let us know the features you need to be successful and we will build them for you. Our competitors want a large percentage of your profits. With eLearning Courses, your cost is $1 per user per course. Our mission is provide the best value for you now and in the future. Our pricing is low and will stay low so you can build your business with confidence.